Many of the beliefs and symbols included in Watchtower publications during the leadership of Russell are what Jehovah's Witnesses now claim to be of pagan and even occult background. If you enjoyed The Da Vinci Code by Dan Brown and are interested in the development of modern religion you will be intrigued by this section. A number of the symbols and teachings discussed by Brown as having origins with the Knights Templar, Freemasons and Illuminati, and tracing back to the Egyptians, have been used by Mormons, Christian Science and Russell's Watch Tower Bible Students. 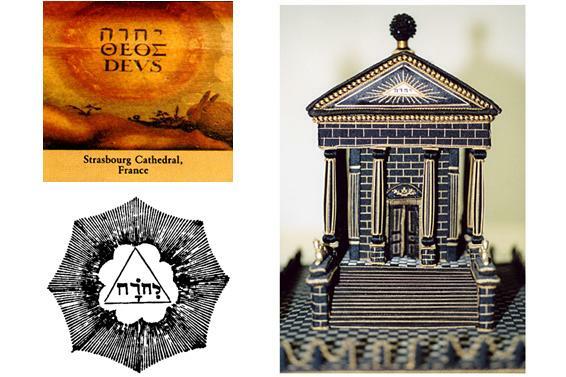 The terms Watch Tower, Golden Age, Jehovah, New World Order, the symbols of the all-seeing-eye, winged sun disk, two columns, pyramids and Russell's strong Zionist stance are part of Freemasonry. 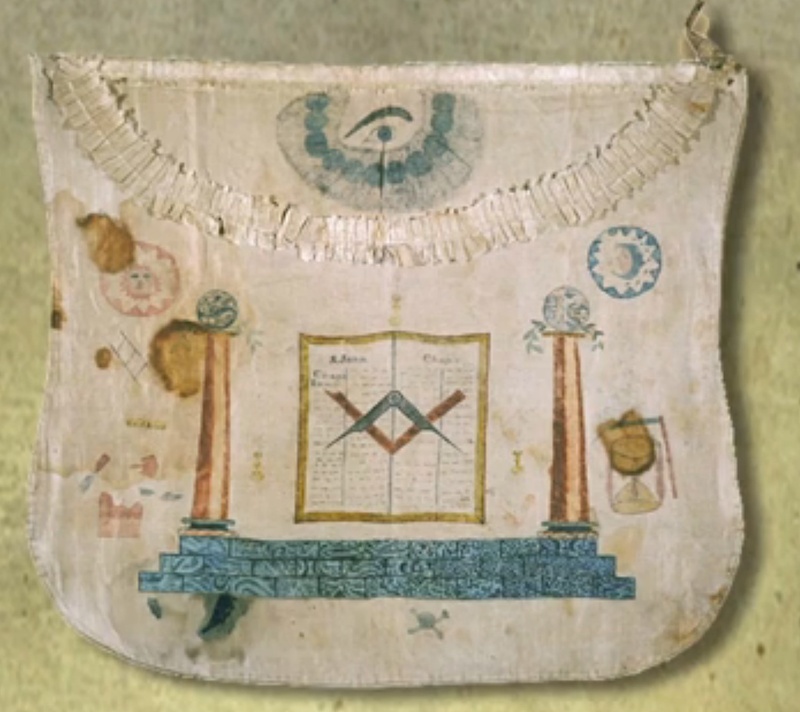 A great deal of discussion has centred on whether Russell, the founder of the Watch Tower Society, had connections with Freemasons, due to the many Masonic symbols introduced under his leadership. 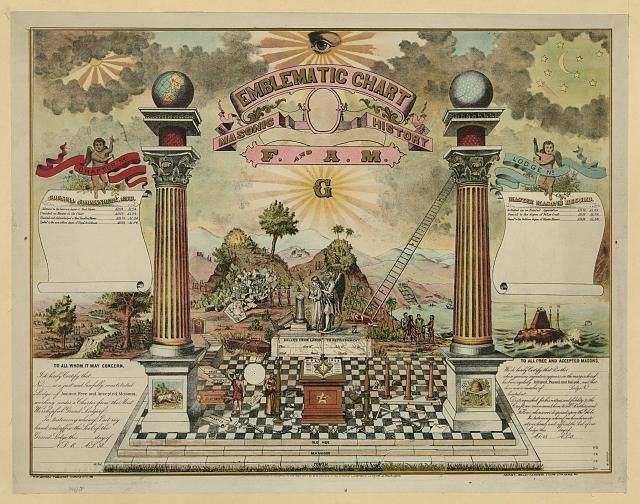 The evidence is not conclusive that Russell adopted these beliefs from Freemasons, and it is probable that he took these beliefs and symbols from Second Adventists. 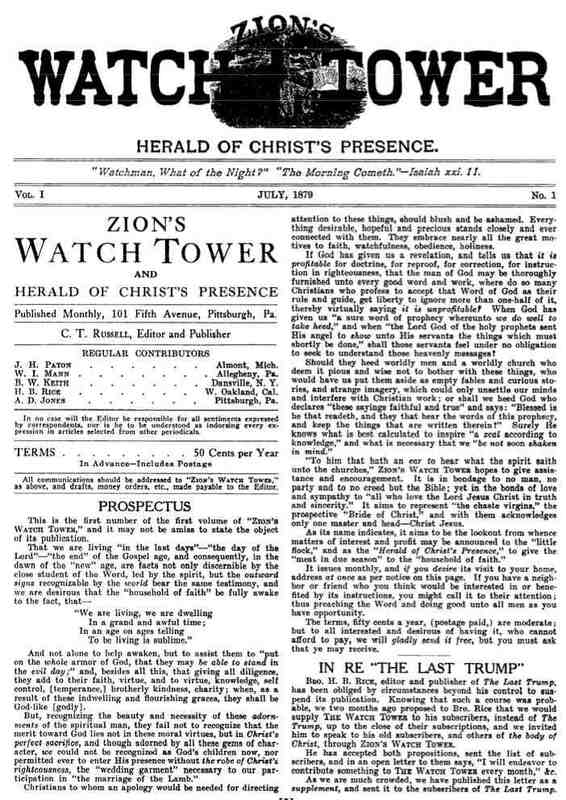 Watchtower claims it was chosen as God's sole representative for being the only clean organisation in 1919. Inclusion of pagan symbols in its worship until the 1930's raises the question as to why God directed, or even allowed, symbols of this kind to identify his people, even well after the claimed cleansing of his spiritual temple in 1919. 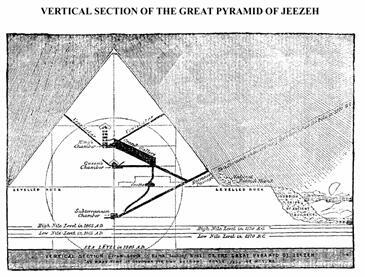 Russell had great interest in the pyramid of Gizeh (or Giza) and its relationship with Bible prophecy, and Rutherford continued to use the pyramid of Gizeh as part of prophecy until the 1930's. 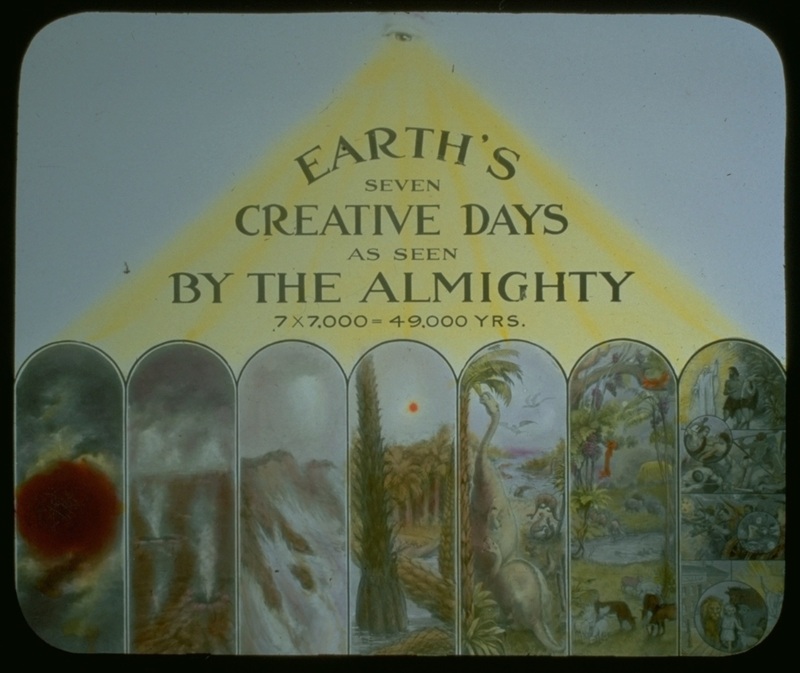 Russell's belief in the sign of the pyramid most likely came from the Second Adventists. In 1859, John Taylor published The Great Pyramid: Why Was It Built? And Who Built It? He put forward the idea that the architect and supervisor of the Great Pyramid was not an Egyptian but Noah. Other pyramidologists believe it was Melchizedek. Piazzi Smyth, an astronomer, accepted this idea. In June 1876, he published an article in the Bible Examiner, a journal owned by George Storrs in Brooklyn. 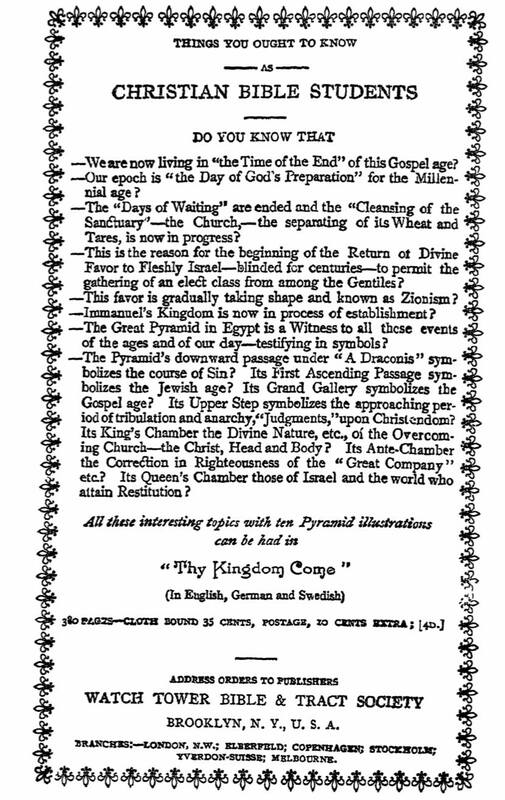 George Storrs went on to run a series of articles on the Pyramid and its prophetic significance in the Herald of Life and the Coming Kingdom. In 1877, Joseph Seiss published a book on the pyramid entitled Miracle in Stone. Russell attributed his knowledge on pyramids to Smyth. 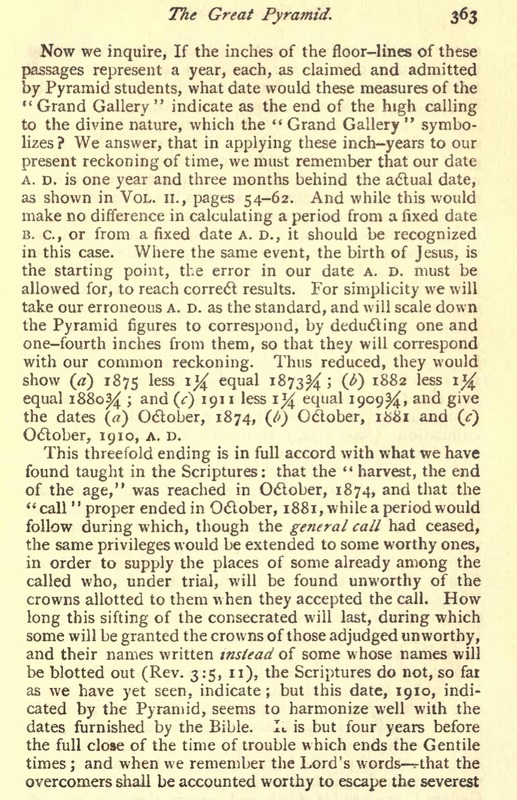 These three dates were important in early Watchtower prophetic doctrine. 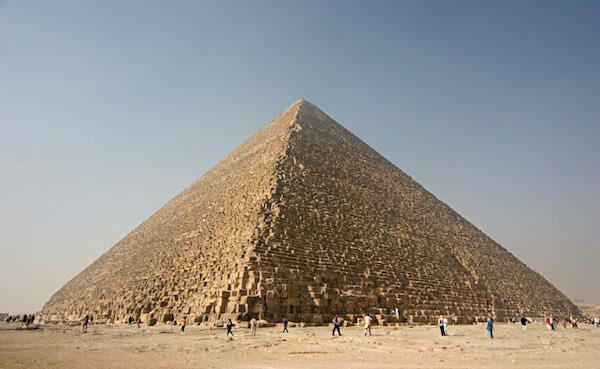 Russell's interest was particularly in the Great Pyramid of Gizeh, built for Cheops. It is the northernmost of a group of 3 pyramids built in Gizeh and is the largest and oldest of the 3, estimated by archaeologists to have been built over 4,000 years ago. It is considered the most colossal single building ever erected. Its base points are accurately oriented to the four cardinal points of the compass. 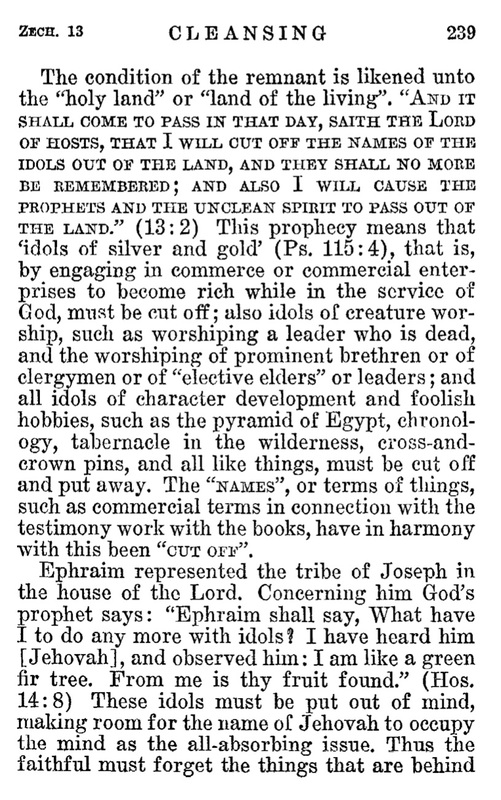 Russell's belief in the message of the pyramids was based on passages from Isaiah 19 and Jeremiah 32. He believed that the sign of Egypt was related to the dimension of the pyramid of Gizeh. In the early 1900's he went to Egypt to measure the pyramid and claimed that the passage of the great pyramid of Gizeh was 2170 inches and that it was built in 2170 B.C.E. The significance of this teaching is highlighted by it having over 60 pages devoted to it in Thy Kingdom Come. 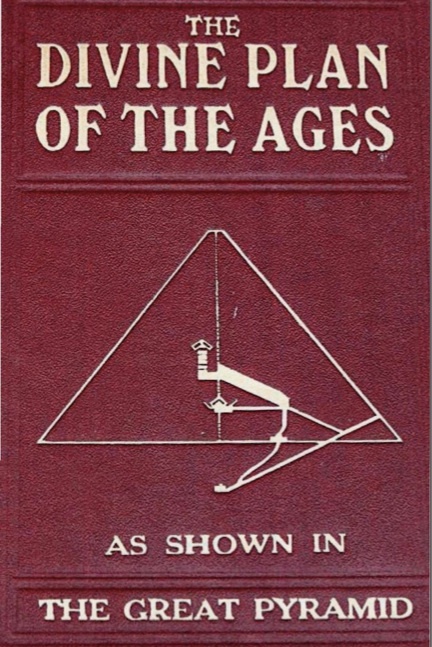 Pyramid as appearing in Studies in the Scriptures - Thy Kingdom Come and on the cover of Studies in the Scriptures - The Divine Plan of the Ages 1913 Edition. In a monumental display of deceit, when Russell revised his doctrine to focus more on 1914 than 1874, he updated his pyramid measurements in later editions of Thy Kingdom Come to suit his new interpretation. 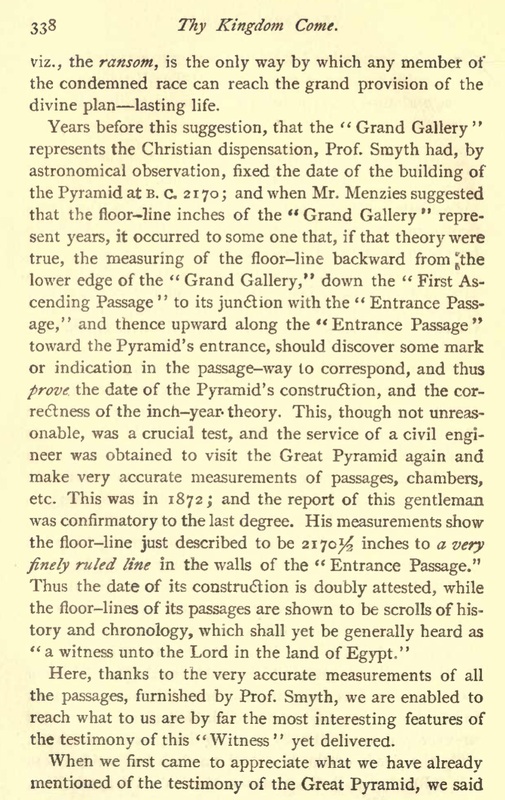 Russell originally used the size of a pyramid to prove that 1874 A.D. marked the beginning of the period of trouble, as shown below in the 1891 edition of Thy Kingdom Come. In the 1911 edition of Thy Kingdom Come, Russell changed the pyramid measurements by 41 inches, to show that 1914 would be the beginning of the time of trouble. "We find it to be 3416 inches, symbolizing 3416 years from the above date, B. C. 1542. 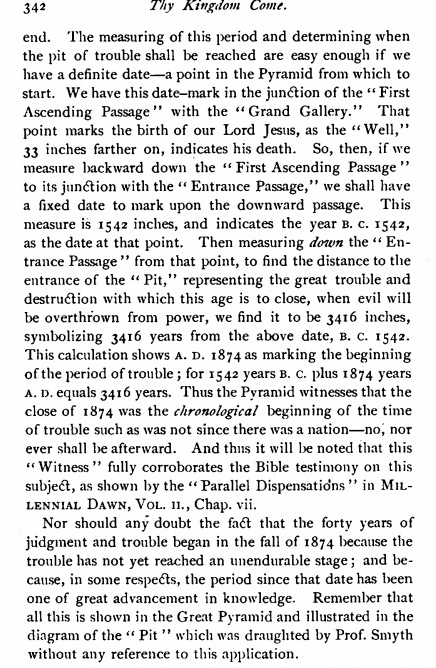 This calculation shows A.D. 1874 as marking the beginning of the period of trouble; for 1542 years B.C. plus 1874 years A.D. equals 3416 years. Thus the Pyramid witnesses that the close of 1874 was the chronological beginning of the time of trouble such as was not since there was a nation-no, nor ever shall be afterward." 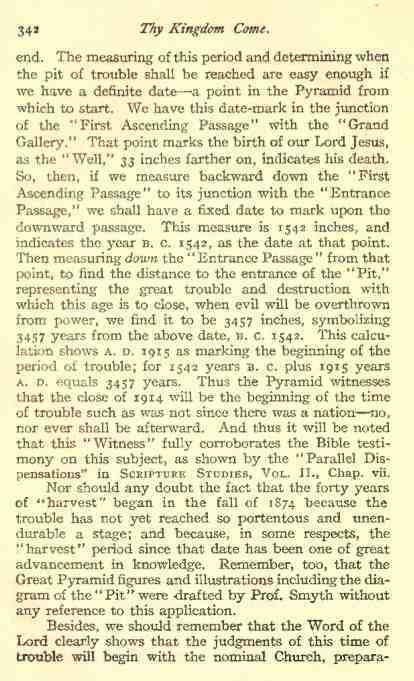 "We find it to be 3457 inches, symbolizing 3457 years from the above date, B. C. 1542. This calculation shows A.D. 1915 as marking the beginning of the period of trouble; for 1542 years B.C. plus 1915 years A.D. equals 3457 years. Thus the Pyramid witnesses that the close of 1914 will be the beginning of the time of trouble such as was not since there was a nation-no, nor ever shall be afterward." 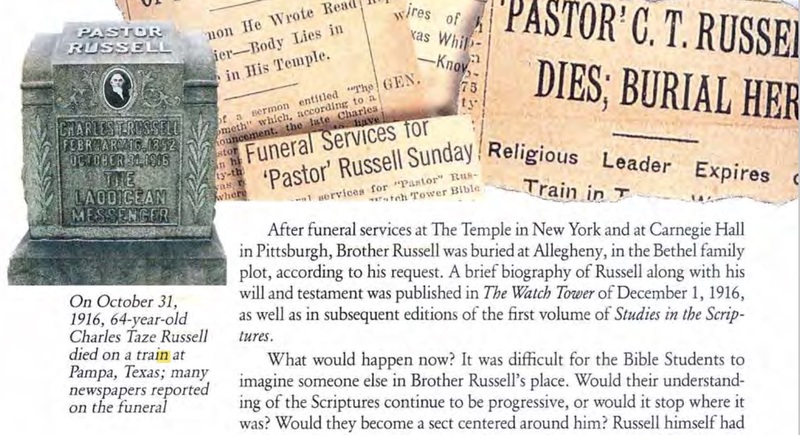 Charles Taze Russell is buried in a family owned grave at the Rosemont United Cemetery, 226 Cemetery Lane, Pittsburgh, Pennsylvania. 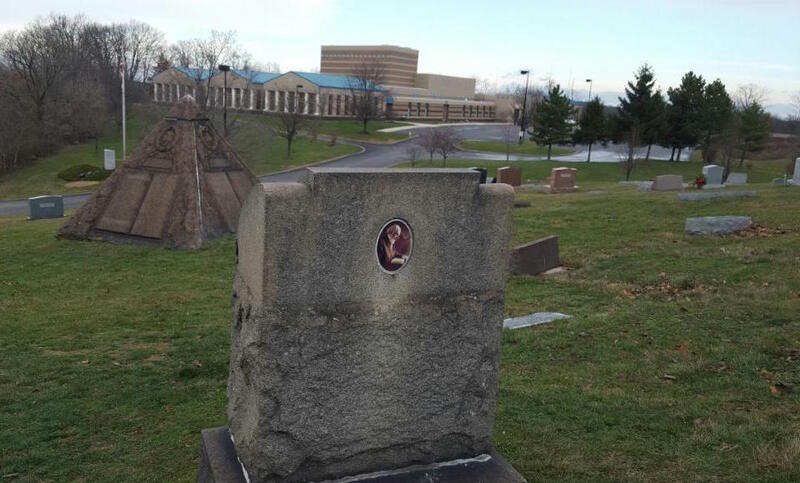 Next to his grave is a pyramid erected as a memorial. 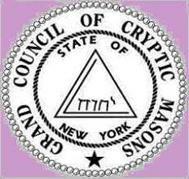 Weighing several tons, it is complete with symbols of the knight's templar, All-Seeing-Eye and the inscription Watch Tower Bible And Tract Society. This cemetery contains the remains of known Masons, and it is claimed that Russell was embalmed at death. A Masonic temple, built after Russell's death, overlooks his grave. 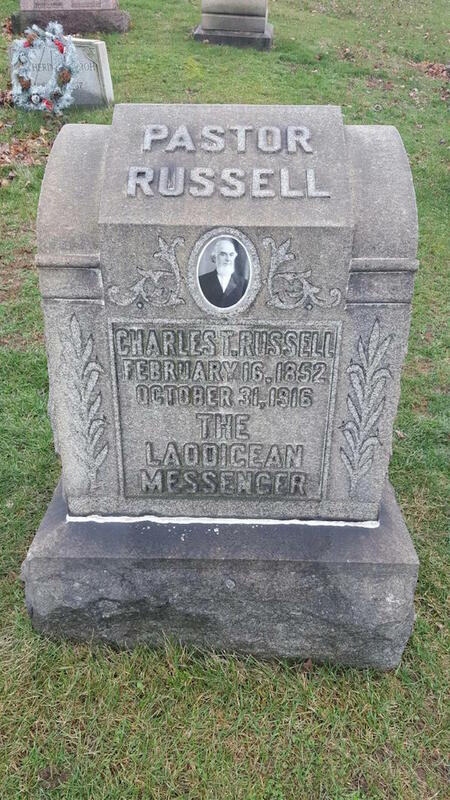 The Proclaimers book discusses Russell's funeral, including an image of this tombstone, but neither mentions or shows his impressive pyramid memorial stone. 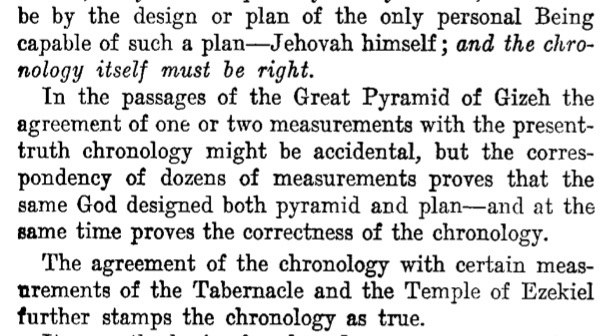 Watchtower belief in pyramidology continued under the leadership of Rutherford as late as 1925. 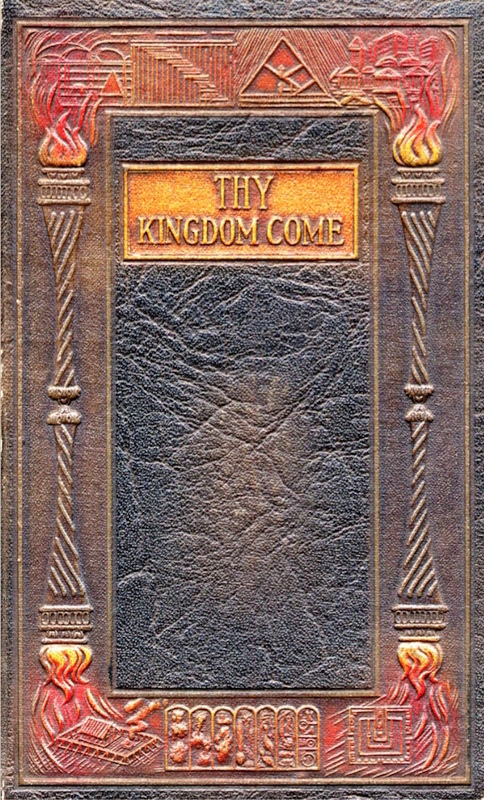 Cover of Watchtower's Studies in the Scriptures - Thy Kingdom Come, 1923 Edition. 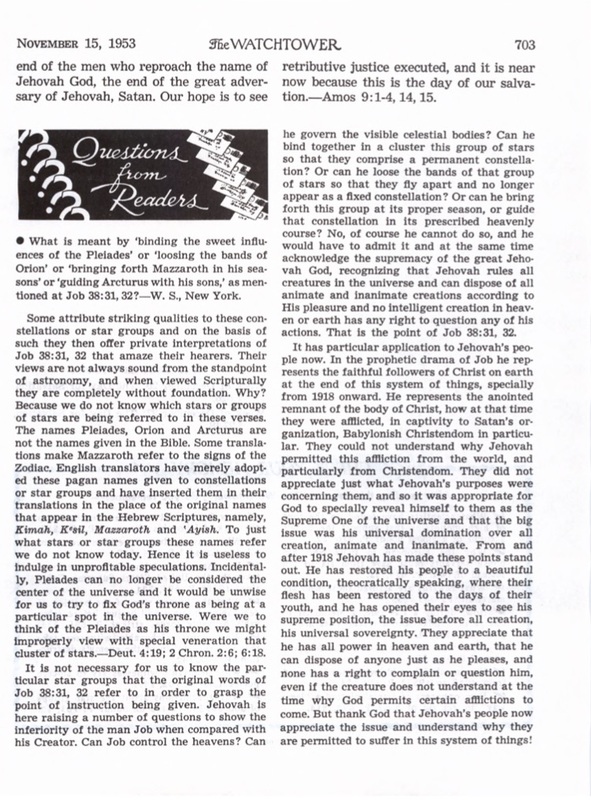 This teaching was absolutely torn apart and discarded by Rutherford in the Watchtower 1928 Nov 15 pages 339-344. Was Rutherford implying that Russell, the religion's founder, was guided by Satan to promote this teaching? It is astounding that after using pyramids to prop up the 1914 teaching for so many decades, that such a dramatic change would occur. Since that time, Watchtower contains a discernible lack of mention of its historical stance on pyramidology. 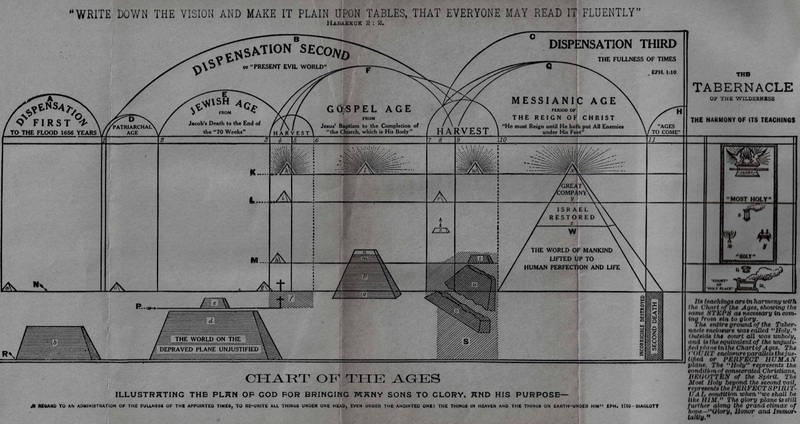 When the 2012 Watchtower Aug 15 p.31 displays an image of the "Chart of the Ages" from Studies in the Scriptures - The Divine Plan of the Ages, it conveniently obscures the pyramid behind an overlay of Benjamin Barton. 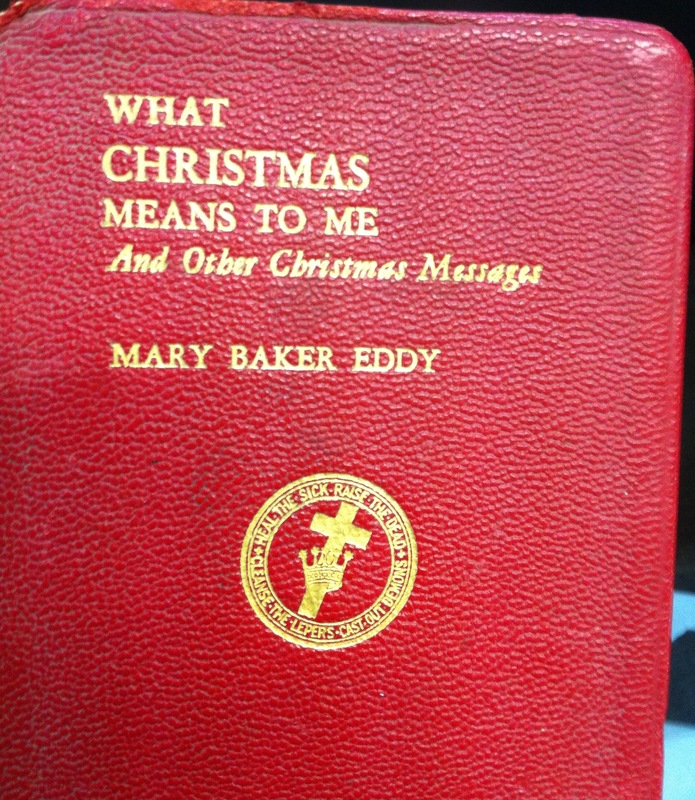 Pyramidology was not a mainstream teaching of Christendom that Bible Students had inadvertently inherited, as Watchtower claims regarding other early practices, such as Christmas. 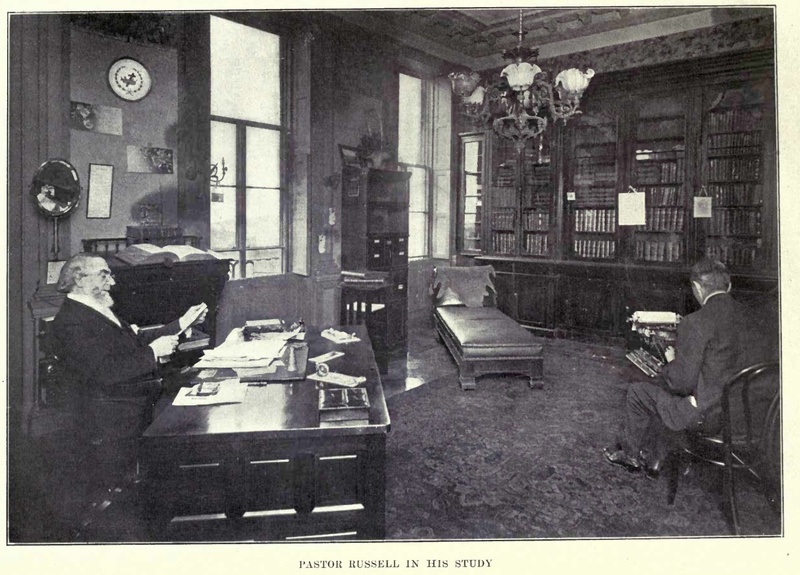 It was an Adventist teaching that Russell introduced. Neither did Jesus cleanse Watchtower of this teaching when he came to his spiritual temple in 1919, as Rutherford continued to promote it until the late nineteen twenties. 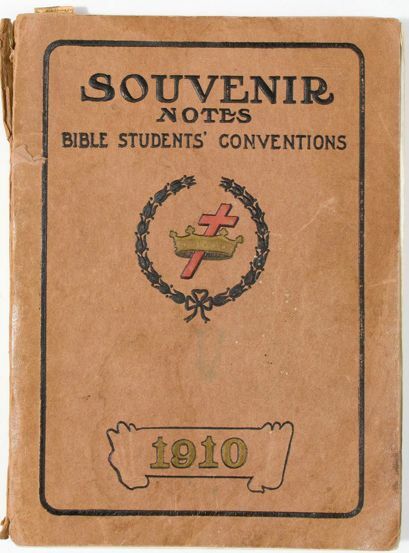 Though Rutherford claims it was from Satan's Bible, he himself had written about it, and Russell had introduced it under the guise of being directed by Holy Spirit as God's chosen "mouthpiece." 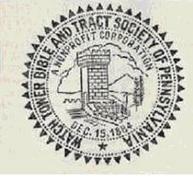 Watchtower used the Cross and Crown symbol for over half a century, until 1931. The crown symbolises the heavenly reward and the cross is for the trials of life endured as a Christian. Bible Students wore Cross and Crown pendants, and the image adorned the cover of The Watch Tower magazine. 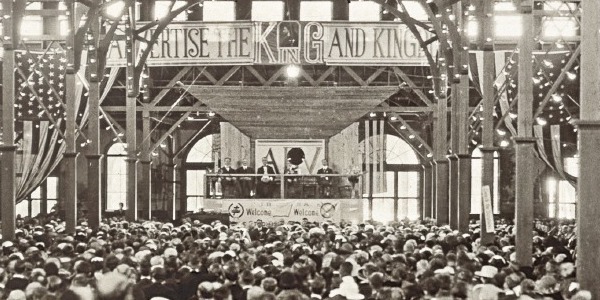 The revered Cedar Point convention in 1922 display the Cross and Crown, Jesus with a cross, and American flag. Whilst Proclaimers mentions that the Bible Students wore a cross and crown, this brief reference fails to explain what this symbol represented, and why they used the Cross and Crown. The Cross and Crown is a symbol synonymous with Christian sects and secret societies such as the Illuminati and Christian Scientists, and also appears on some Catholic Churches. The Cross and Crown is also referred to as the Knight's Templar, as it is used to identify the Freemasonry group the Knight's Templar, in honour of the 12th century Knights that are said to have devoted their lives to the crusades, protecting pilgrims to Jerusalem, and guarding the Holy Grail. A Wreath surrounds the Cross and Crown that appeared on The Watch Tower cover. The wreath symbol also is used in the United Nations and Star Trek logos, both heavily influenced by Freemasons. 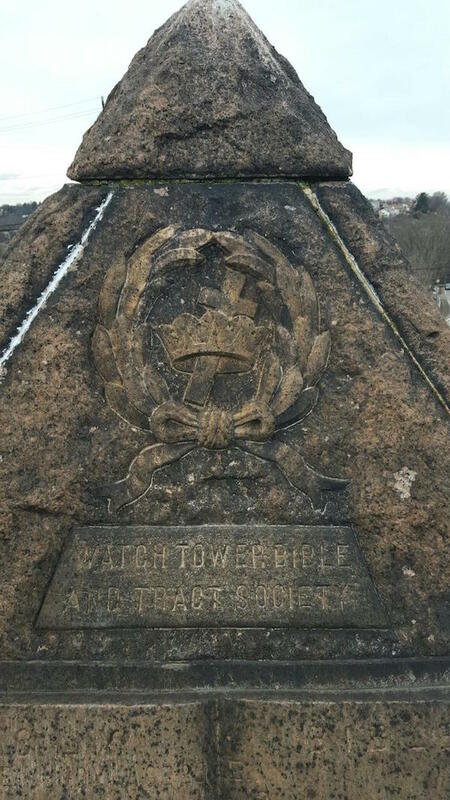 The Cross and Crown were used for over 50 years, and appear on each side of the pyramid monument that adorns Russell's grave. If Watchtower is Jehovah's Organisation and directed by his holy spirit, why would Jehovah allow Watchtower for decades to promote what it now claims is pagan symbology? 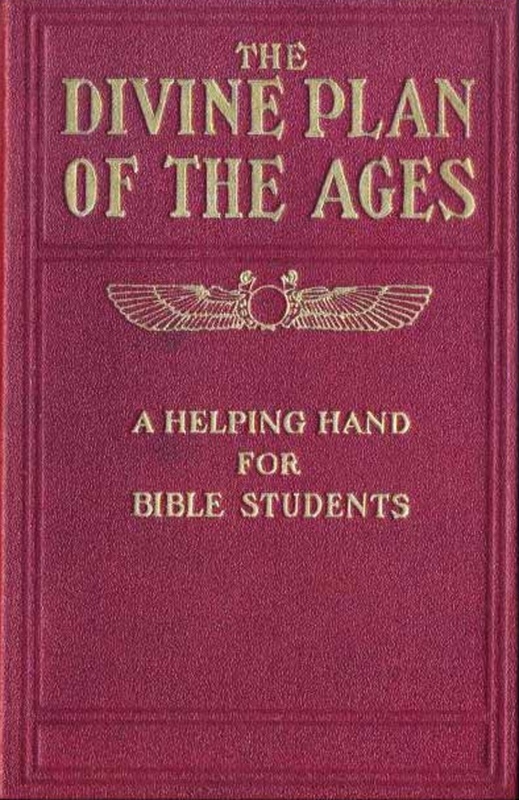 The Winged Sun Disk, an Egyptian religious symbol used by Freemasons and occult groups, appeared on the cover of some editions of Studies In the Scriptures Series. The 4000 year old Winged Sun Disk is found in Egypt and Mesopotamia, and associated with the sun and sun deities. 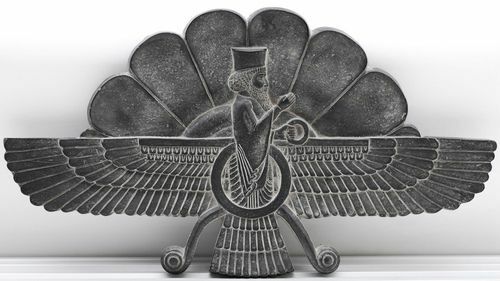 The sixth century Iranian religion Zoroastrianism adopted it with inclusion of a human figure under the term Faravahar. The Rosicrucian Order, AMORC (Ancient and Mystical Order Rosae Crucis) is an occult organization that uses the Winged-Disk as their logo. "The Winged Globe is pre-eminently a Rosicrucian symbol, although the Illuminati may lay claim to it, and it may be admitted that it is of Egyptian origin. The Winged Globe is the symbol of the perfected soul making its flight back to the source of its creation in the Elysian fields beyond." This is not a common symbol of Christianity that Russell inadvertently borrowed, this was an unchristian symbol solely of pagan origins. In more modern times, Watchtower has described this symbol as pagan, carefully avoiding mention that this symbol was used by Watchtower itself. 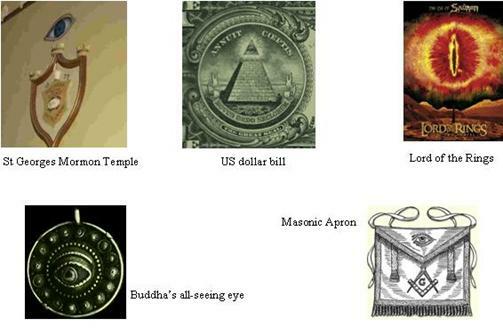 Crowning Russell's pyramid is the All Seeing Eye, a symbol used by Egyptians, Buddhism, occult worship, Freemasonry, Mormons, and appears on the American dollar bill. 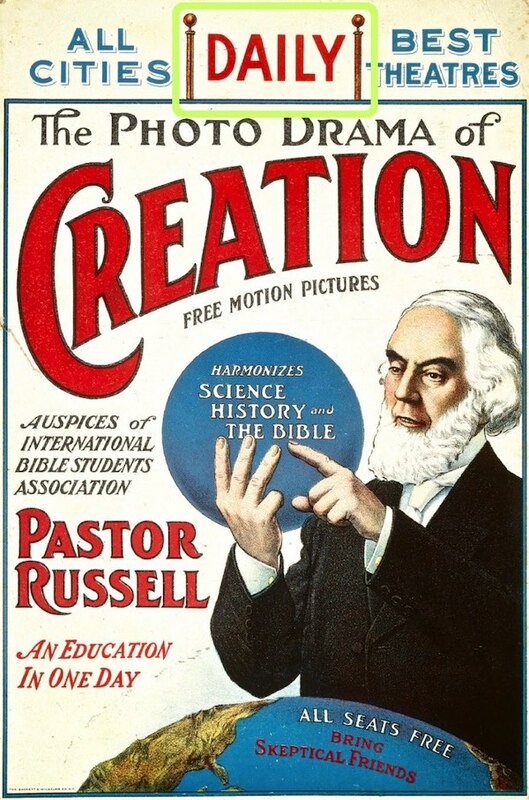 Russell used the all-seeing-eye in the 1914 motion picture, The Photo Drama of Creation. 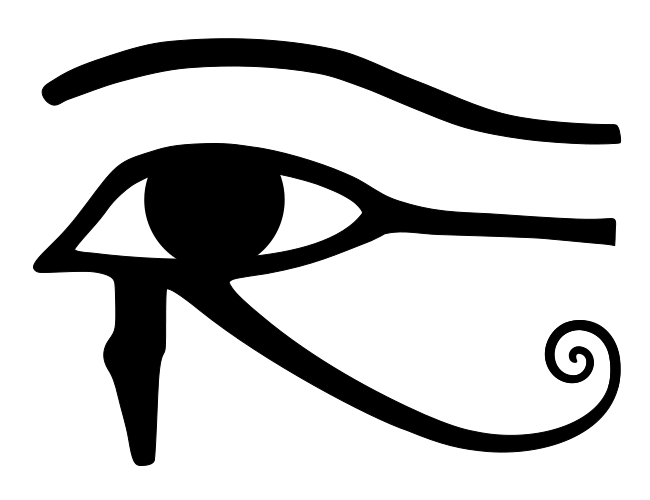 Other names for this are Eye of Horus or Utchat Eye, as it is associated with both the Egyptian God Horus (god of war) and his father Osiris (who along with Isis comprise the Egyptian Triad). Called the "mal ochio" (evil eye), this object is regarded by Satanists as the symbol of Lucifer. It is known to have been Satanist Aleister Crowley's favourite symbol. To understand why Russell had an interest in the All Seeing Eye, we can look to the meaning Freemasons bestowed upon it, as explained by Albert G. Mackey, M.D. The reason Freemasons use this symbol invokes Biblical connotations, yet has pagan origins. The Tetragrammaton and word Jehovah have been used by Freemasons over the centuries. "Another important symbol is the Ineffable Name, with which the series of ritualistic symbols will be concluded. The Tetragrammaton, or Ineffable Word,-the Incommunicable Name,-is a symbol-for rightly-considered it is nothing more than a symbol-that has more than any other (except, perhaps, the symbols connected with sun-worship), pervaded the rites of antiquity. The triangle is another symbol which is entitled to our consideration. There is, in fact, no other symbol which is more various in its application or more generally diffused throughout the whole system of both the Spurious and the Pure Freemasonry. 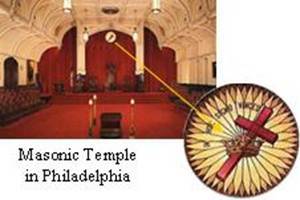 The following are Masonic images and a 9 inch Model Temple at the Masonic Library and Museum of Pennsylvania. The star on the original Watchtower seal has Masonic connotations, being used on Masonic Seals. Two columns appeared on the invitation to The Photo Drama of Creation, and some editions of Studies in the Scriptures. 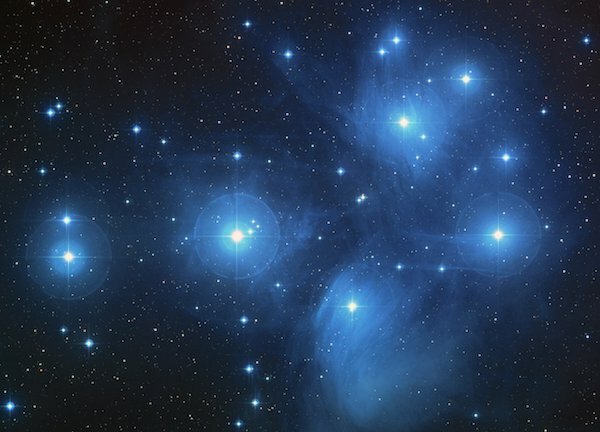 The Pleiades are a dipper-shaped cluster of stars situated in the "shoulder" of the constellation Taurus. To the ancient Romans the constellation of the Pleiades was known for its association with homosexuality. In the 20th Century, it was popularised by the UFO and flying saucer buffs. Also known as The Seven Sisters, it is mentioned in the Bible in Job 9:9, Job 38:31 and Amos 5:8. The constellation symbol is found on the west tower of the Mormon Temple and was known by the Egyptians as the "Dragon of the Seven Stars." I have heard Jehovah's Witnesses belittle the Mormon belief that they shall rule on planets as gods. It may surprise these people that both Russell and Rutherford taught that when they died they would be taken to the Pleiades constellation, which was said to be the dwelling place of God. This is a close parallel with the Mormon belief, that on their resurrection they become gods on various planets. Russell took this idea from Seiss. Seiss taught that the physical construction of the Great Pyramid indicated that Alcyone (the central star in the Pleiades constellation) is at the centre of the universe. This belief appears in Studies in the Scriptures, Series 3, Thy Kingdom Come page 327. 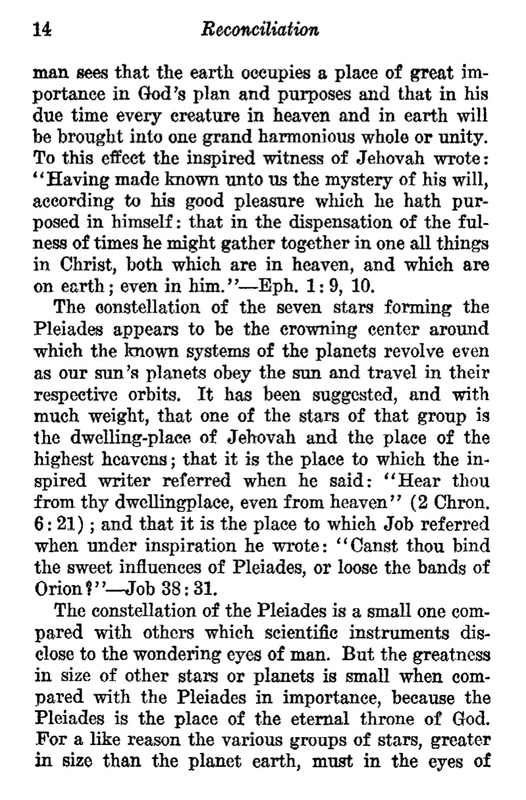 Rutherford continued with the teaching, with mention of Pleiades in the 1927 book Creation. 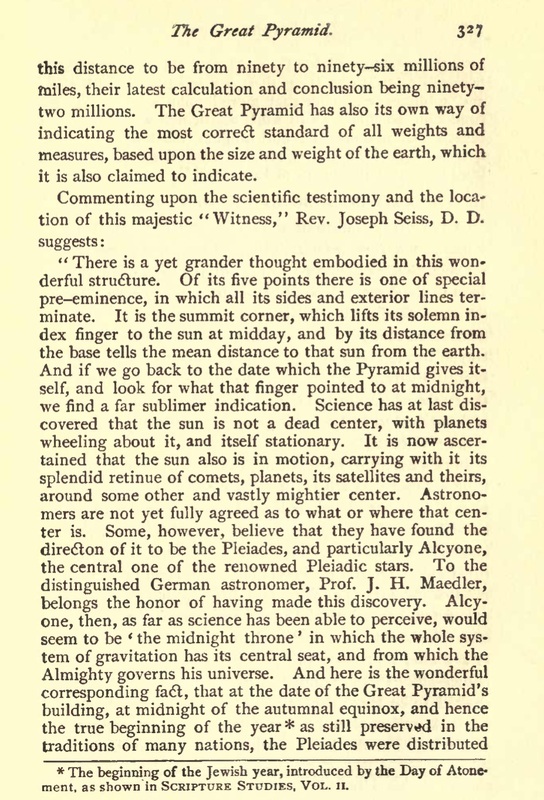 Pleiades was discussed in more detail in the 1928 book Reconciliation. "The constellation of the seven stars forming the Pleides appears to be the crowning center around which the known systems of the planets revolve even as our sun's planets obey the sun and travel in their respective orbits. It has been suggested, and with much weight, that one of the stars of that group is the dwelling-place of Jehovah and the place of the highest heavens; that it is the place to which the inspired writer referred when he said: "Hear thou from thy dwelling place, even from heaven" (2 Chron. 6:21); and that it is the place to which Job referred when under inspiration he wrote: "Canst thou bind the sweet influences of Pleiades, or loose the bands of Orion?" --Job 38:31. This doctrine was not discontinued until 1953. The Watchtower subtly blames the members, saying 'some attribute striking qualities', but does not refer to the fact that the reason the members had this belief was that it had been taught in Watchtower publications. Russell was not only into Egyptology, but also referred to Astrology for confirmation of his predictions. The constellations of the Zodiac were regarded in 1914 as of Divine origin, with each of the 12 Zodiacal signs having corresponding statements in the Bible. Uranus and Jupiter meet in the humane sign of Aquarius every 80 or so years, and this occurrence is held as a powerful sign by Astrologers. The start of World War One in 1914 has been stated by Astrologers to be proof that extraordinary events do occur with the meeting of Uranus and Jupiter in Aquarius. 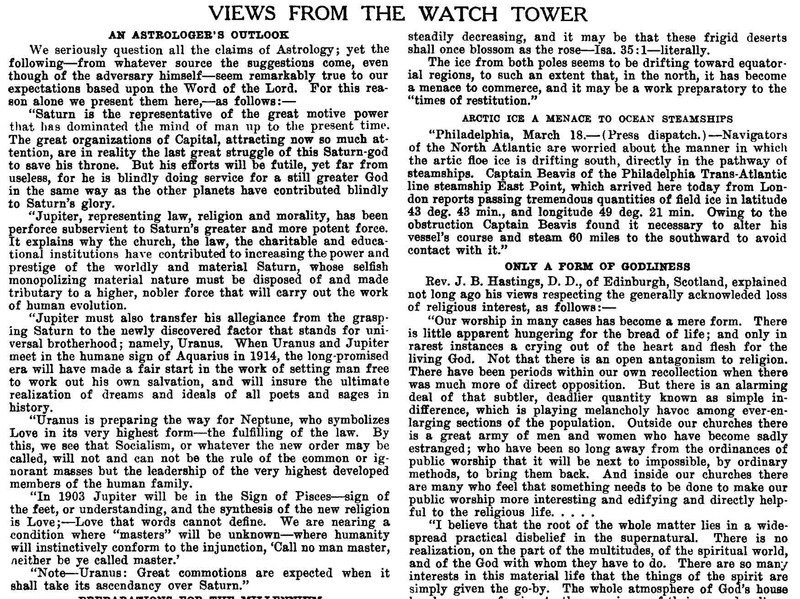 The 1933 book Occult Theocrasy, tracing religious occult beliefs throughout history, includes apt discussion of The Watch Tower. 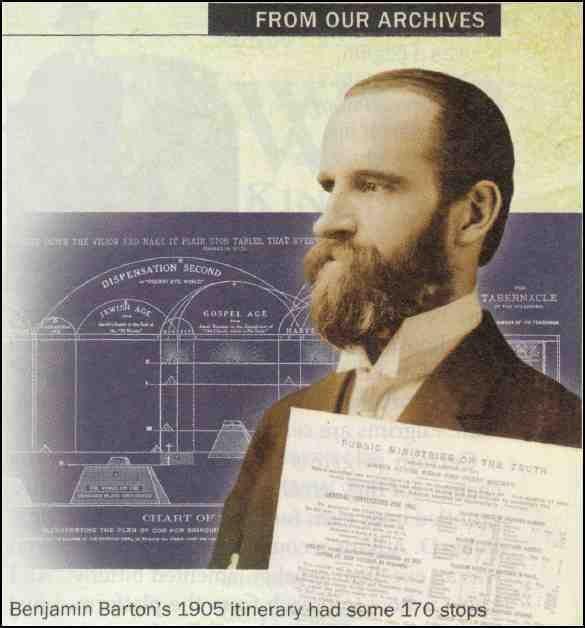 A look at the history of Jehovah's Witnesses show Russell was greatly influenced by Masonic teachings, partly due to the views of Adventist teachers around him. These were not a minor error on his part, but rather well developed teachings that were promoted for fifty years, well into the leadership of Rutherford. 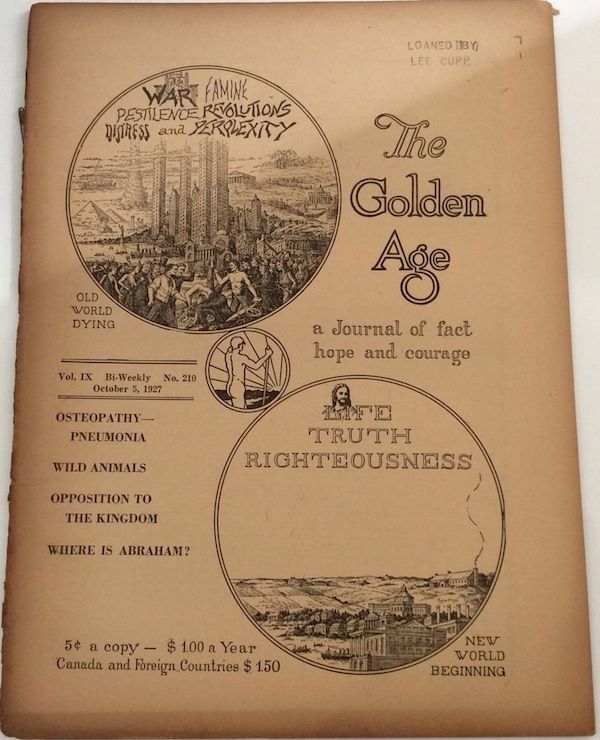 Long after Jesus is said to have inspected and cleansed his organization in 1919, Jehovah's Witnesses continued to promote these pagan views as truth. It is difficult to reconcile these teachings with Watchtower statements that they are the only channel the Lord uses to feed his members with truth, and that there has been no significant change in the truths they have promoted. Written 2007. Latest update Oct 2016.